The cottage has 3 bedrooms, a large lounge with wood burning stove, colour TV, DVD. The well equipped kitchen has a microwave, fridge and freezer. Washing machine and tumble dryer are in the utility room adjoining the summerhouse. There is a bathroom and a shower room both with WC. The garden backs onto paddocks and has a Weber BBQ. Garage and off road parking for 4 cars. It is located in the centre of this small unspoilt village on the beautiful North West Norfolk coast, 3 miles from the holiday resort of Hunstanton. Salt marshes and the beach are a short walk across open fields and sand dunes. OPEN ALL YEAR. INCLUDING CHRISTMAS AND NEW YEAR. The bird reserves at Titchwell, Holme, Snettisham and Cley are a short distance away, with Scolt Head a boat ride from Brancaster Staithe. Other places worth a visit along the coast are Thornham and Wells-next-the-Sea, where working fishing boats may still be seen and Blakeney, famous for its seals. The cottage is a short car ride from the historic houses at Sandringham, Holkham and Houghton and ideally placed for walking or cycling along the coast or inland towards Sandringham or Burnham Market. Local attractions are many including the Seal Hospital, Norfolk Lavender, the Sea Life Centre - all within 15 mins drive. The village has a pub, The White Horse, which serves excellent meals and village shops can be found in the neighbouring villages of Old Hunstanton and Thornham. 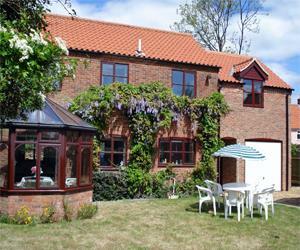 Very well placed for public transport with a nearby bus stop serving coastal resorts, King's Lynn and Hunstanton. Light & Airy conservatory & separate summer house/ children's playroom. 15 minutes walk to Saltmarsh and Beach. Nearby pub with good food. Several bird observatories in village. Golf and sailing are nearby with stables in the village. Limited freeview service. Cycle storage available. Freeview TV and DVD. Children welcome from any age. Take A149 from Hunstanton and take the 2nd of 3 turnings left into Holme, this is Peddars Way. At the T-junction turn right into Kirkgate Street. Broadwater Cottage is 50yds on the right. Nearest station is King's Lynn. Coast Hopper bus service from King's Lynn, Hunstanton, Wells and Cromer.